A Chef’s sampler platter of charcuterie and artisan cheeses at Porter and Pig in the Village at Wexford. Sweet dates stuffed with chorizo and wrapped in crispy bacon finished with a side of creamy jalapeño sauce. Beer braised, homemade sausages with beer onions and homemade Stone Smoked Porter mustard on a toasted roll served with crispy kettle chips. An a la carte order of artisan cheeses and meats, served with pickled vegetables, olives, sliced bread, berry compote, nuts, and fresh and dried fruits accompanied by a locally crafted beer. 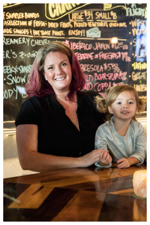 Yes, these and other delicious dishes attract people to Porter and Pig, but the true siren song of this trendy (but not in man-bun, hipster kind of way) dive bar is its owner Ivy Burdick. “No, now I don’t want to talk about me,” Burdick said. We are sitting at her bar. I’m savoring a glass of Butternut pinot noir. Burdick starts to take a sip of her white wine when the phone rings. Because of hurricane Matthew and Governor Nikki Haley’s mandatory evacuation, outside is like a scene from an apocalyptic movie. There are few lights on and even fewer signs of life. Burdick answers the phone. 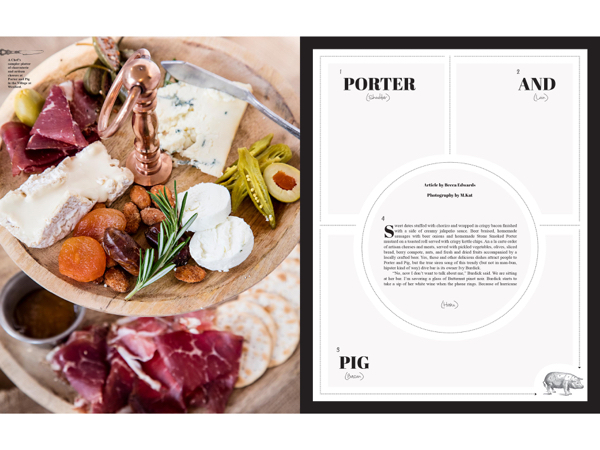 “Thanks for calling Porter and Pig…yes, we’re open…we would be happy to set a table aside for you…great, thanks.” She hangs up and then walks back to the bar. “Where were we?” she asked. “We were talking about you,” I joked. We arrive on the topic of community involvement because a national guardsman is parked nearby and Burdick wants to see about feeding people who are part of the relief effort. Having been on Hilton Head Island for a long time, we have both evacuated before but this time feels different. It was as though we were counting down to something unsettling. Something life-changing. Something disastrous. And by her body language, it is obvious Burdick is worried and wants to protect not just her bar-restaurant, but Hilton Head Island. I mention I live by deep water, and she quickly offers to help move my furniture and rugs upstairs, which is touching and telling, because she has a home, family and business to manage. But she naturally puts other people first. Ivy Burdick and her daughter Phoebe. Porter and Pig also makes food approachable and affordable. “We have six to eight different cheese selections, and you can customize the board to fit your needs. That way you can have a glass of wine with some friends and get $5 worth of great cheese to share for a light bite,” Burdick said. 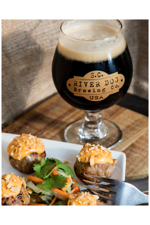 Porter & Pig is located at 1000 William Hilton Parkway, Village at Wexford, Suite J7C. 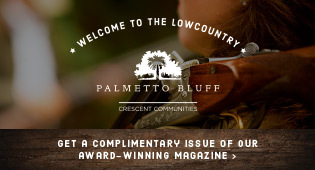 For more information, visit porter-pig.com or call (843) 715-3224.